Temperature is a critical factor in almost all manufacturing and refining processes. As such, process plants have developed a variety of useful technologies related to accurate temperature measurement and control in their operations. Heat tracing is one well-known method to keep process media warm. This process involves applying an external heating source to process pipes, tanks, or other vessels. Steam tracing is a form of heat tracing that circulates steam around process pipes to keep the process media within a specific temperature range. Tracer lines are the tubing that carries the steam alongside the process pipe. Both electrical heat tracing and steam tracing are commonly used at process plants. Low- or slow-flow piping sections such as branch connections from parallel heat exchangers or pumps, or bypasses around equipment. Equipment or piping that needs to be kept warm due to low ambient temperature conditions. Suction piping of a gas compressor from the outlet of the upstream KO drum (to prevent condensation). Inlet piping of relief valves (to keep the piping and valve interior free of any precipitating materials or crystallized hydrates). Prevent process media from solidifying due to wax separation, crystallization, and water freezing. Maximize plant efficiency, as instrument bridles and external piping to the process are inherent heat sinks. Maintain the fluidity of viscous products during shutdown or in isolated piping. Avoid fluid-component separation caused by low temperatures. Prevent freezing of process media that contain water. Prevent condensation of gaseous process fluids. Prevent pipes from being damaged by very cold ambient temperatures. Prevent formation of hydrates or related compounds as scale in pipes due to low temperatures. 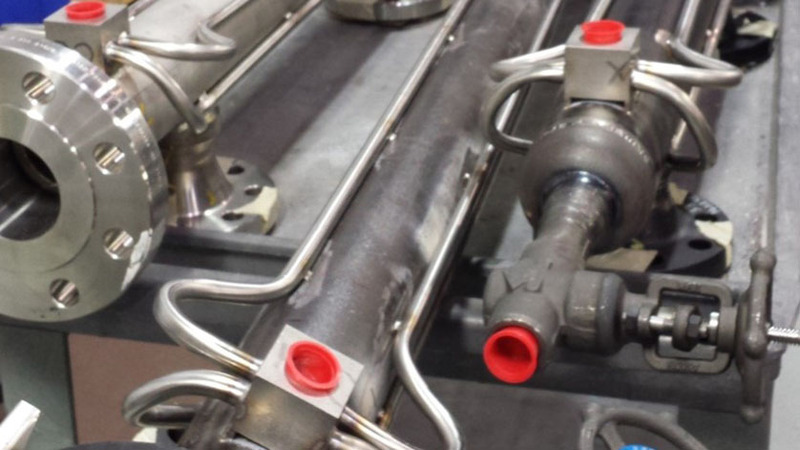 WIKA has manufactured and installed steam tracing systems at dozens of process facilities. All WIKA steam tracer lines are pre-welded to NPT blocks so you can thread directly into the steam lines, saving you time and money by avoiding unnecessary welding to install the traced lines. NPT also means you can quickly disconnect steam tracers as necessary. Let WIKA’s steam tracing experts help you keep your processes flowing smoothly. Our experienced technical sales team and engineers will work closely with your staff to develop the ideal steam tracing system for your needs.